Sand, Wind and Stars - LRDG, 70 years on: Look out North Africa. It seems odd to be writing this after we have covered over 1200 miles, but it would be laborious to cover events in strictly chronological order. 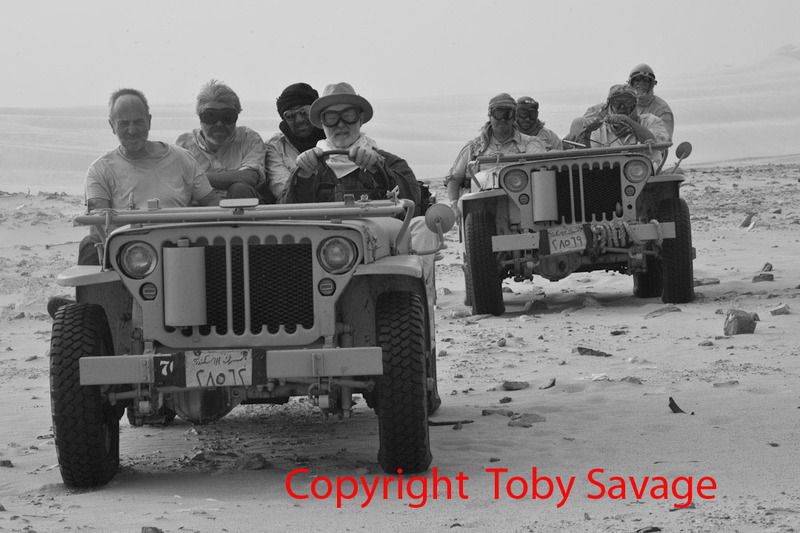 Our aim was to live the life of a small patrol of LRDG/SAS servicemen on a genuine route through the Sahara in authentic cars. We have succeeded beyond our wildest dreams and are now in Siwa for our first shower of 8 days. Sand and dust form a thick coating on our tired bodies that has prevented sun burn and not been particular uncomfortable. Sure, we have had breakdowns and had to keep on top of servicing with two 70 year old jeeps, but it is remarkable what can be done with a length of fence wire and some ingenuity. All laptop batteries flat and no electricity here so over and out for now. Photo is in the style of the original SAS promo shot. We have looked like this for 8 days now. Fantastic shot Toby. Looks like you have the hun on the run. Bet the first 'ice cold' went down well!! Congrats! I can't wait to hear all the gory details. "but it is remarkable what can be done with a length of fence wire and some ingenuity." Well done on a mission completed. Looking forward to the update. What a trip and that is a brilliant photo.